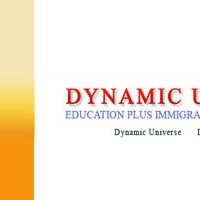 Originated from American Computer Institute in 1997, Dynamic Universe was baptized on the initiative of Mr. Raj Kumar Bartaula at Putalisadak in Kathmandu, Nepal in the year 2004. This has stridden a long pace in overseas study within a short span of time without any hurdles and barriers, establishing four branches and opening other branches soon in all cities of Nepal to ease predominant Nepalese students. Dynamic Universe has achieved remarkable success in abroad study from its inexhaustible works. This has adorned with pain-staking staffs, proficient instructors and expert counselors to pursue invincible achievement in overseas study. They are working for many genuine students who tend to study various courses in many Colleges and Universities over the world- mostly in the USA, UK, Australia, Canada, New Zealand, Germany and Singapore. They offer TOFEL, IELTS, SAT, ACT, GMAT, GRE and visa preparation classes in very nominal cost to the students who need the scores for colleges and universities and help half through full scholarship for capable ones. Moreover, numerous students are wandering in search of a good consultancy and squandering their auspicious time and amount from the claw of errant counselors. Therefore, they are providing sound and staunch counseling for those students to render proper guidance. The organization has surmounted the heart of considerable Nepalese students and become the apple of their eyes since it evolved.